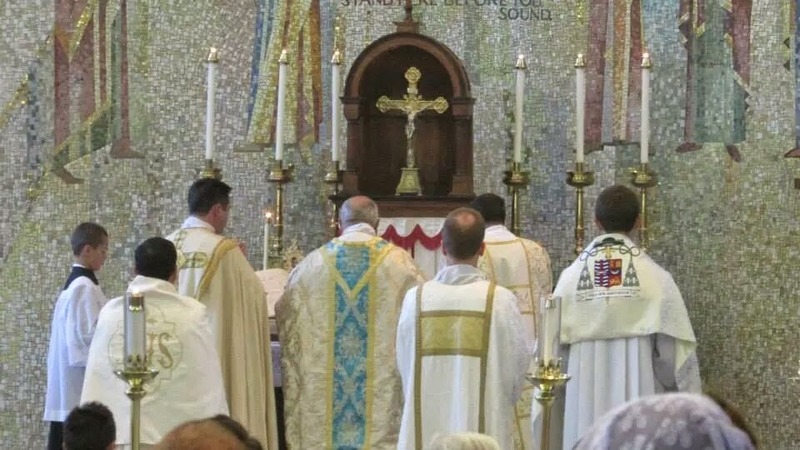 As regular readers may have noticed, Bishop Robert Morlino of the diocese of Madison has made a point of celebrating Pontifical Masses at the Throne I'm the Extraordinary Form for his diocese on an approximately monthly basis with the assistance of many diocesan priests and the Madison Tridentine Mass Society. I have been blessed to not only have him as a bishop, but to be able to assist with these, both in the planning and preparation side as well as in the execution from the loft. The next pontifical Mass at the Throne will be tomorrow evening at the Bishop O'Connor center on Madison's west side. Mass begins at 7pm. Mass IX, Credo III, as well as Juan García de Salazar's Alma Redemptoris Mater will be sung. It's also worth noting that a full pontifical set of vestments was commissioned for this Mass, and for use with future Masses. Details on those vestments can be found here.